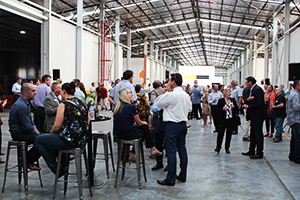 The Southern Star Group celebrated our new aluminium powder coat line and logistics facility in Tobab Court with 300 visitors on Thursday 17th November, hosting the Geelong Chamber of Commerce November After Five function. We were thrilled to welcome the 300 strong contingent of local business leaders and representatives from the Geelong business community, who came together to network and celebrate the regions many businesses, many of which took the opportunity to tour our new 11,000 square metre facility and inspect Australia’s longest powder coat line at 200-meters. Federal member for Corangamite, Sarah Henderson, was among the guests who enjoyed a tour of the facility that solidifies our investment and dedication to the growth of our business in the Geelong region. In a time where many of Australia’s manufacturers are struggling to survive and, sadly, closing their doors, we are proud to be a thriving and innovative business in Geelong. Thank you to all who joined us and helped to celebrate our expansion and investment.